This Ice Cream Parlour Is Finally Opening In Gurgaon's Galleria Market. 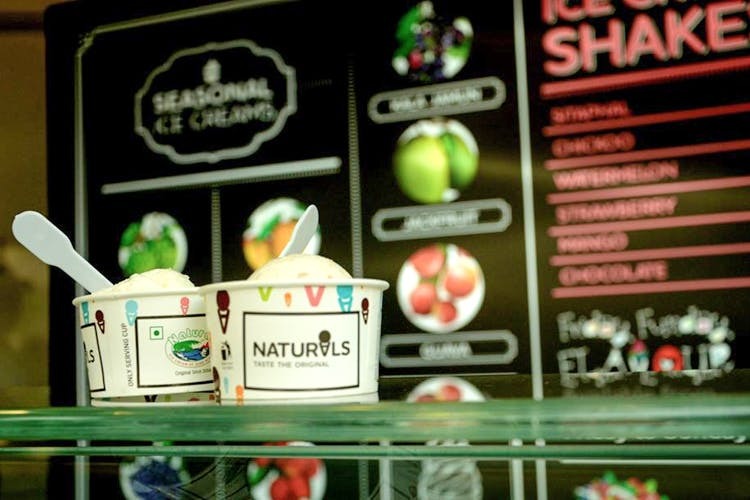 Easily one of the most popular ice cream parlours, Naturals has opened an outlet in Gurgaon’s Galleria Market. No need to come all the way to Delhi for their ice cream now. Naturals stand true to its name. They use real fruit ingredients in their recipe and have both seasonal and permanent ice-cream flavours. Summer is spent best with their mango and litchi ice-creams, but we are in love with their round the year flavours as well. Treat yourself to some Tender Coconut, Kesar Pista or Papaya Pineapple, filled with fruity goodness. In addition to their ice creams, they also do ice-cream shakes. Definitely a change from the regulation shake, the Sitaphal and Chiku are definitely worth a try. Not a fruity person? Stick to good ol’ chocolate. They have a chocolate section that’s to die for as well. Their freshly-baked waffle cones are almost as good as their ice creams. We’re thrilled that the wait is now over, and we get to enjoy their ice cream in Gurgaon.